The recent shooting of Suge Knight at a Sunset Strip nightclub has remarkable parallels to an assassination attempt on the life of LA mob boss Mickey Cohen in a nightclub at the same location, 9039 Sunset Blvd., 65 years ago. This incident of history repeating itself is covered at Playground to the Stars. 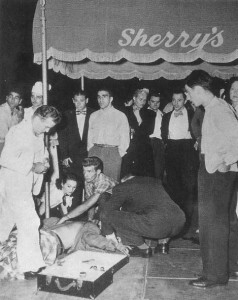 I detail the 1949 ambush of the Cohen party outside of Sherry’s nightclub (which became Gazzarri’s, then, in a new building, the Key Club, now 1 Oak), in my book, Mickey Cohen: Life and Crimes of LA’s Notorious Mobster. In the biggest outbreak of violence in LA history, up to that time, among several injured were two women: Hollywood beauty Dee David, and Mickey’s on-payroll newswoman, Florabel Muir. The newest and most controversial of Mickey’s bodyguards, Special Agent Harry Cooper, a highly ranked state officer — appointed by California’s attorney general to protect the mobster — was critically injured. The Mick was just winged, but his lieutenant, Neddie Herbert, died of his wounds. I reveal Shirley Temple left the club just before the fireworks began. In another parallel, Justin Bieber (like Temple, a youthful superstar) had left the party shortly before Suge Knight was shot. A romantic postscript to the Cohen story: Dee David married (and later divorced) state officer Cooper, when they recovered from their injuries; Mickey had introduced the pair that evening. I wonder if there will be any marriages born of the recent shooting on the Sunset Strip? And more: In 1955, Dee David shot top Cohen mobster, Joe Sica, in a business dispute. Allegedly, Joe and his brother, Fred, had threatened and beat David (over her bad faith business dealings with Fred), and she then shot Sica. He survived the shooting, and the conflict was settled in court. Mickey Cohen appeared on the stand and disparaged Miss David’s character. The Sicas won the case.